Ely Tennis Courts: Located just off of State Road downtown Ely. The trail goes right by this area and is just to the south of Casey’s. Odies Bar and Grill is in town and a great place to stop. The Casey’s store does not sell premium non ethanol. The closest is Solon at the BP which is about 10 miles. Lakeview OHV Park: Located in Johnson County north of Iowa City. From Interstate 380: Take exit 10 – F12/120th Street. Go East approximately 6 miles turn right onto Ely Road NE follow Ely Road about 1.5 miles, turn right onto 140th Street, the parking lot will be on the left. 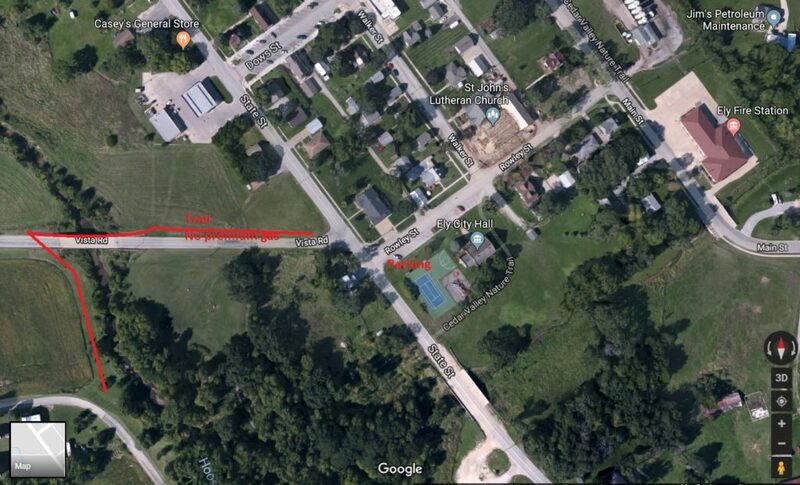 Solon Sports Complex – located at the corner of Racine Ave and W Sovers Street, right behind the Catholic church in Solon Iowa. Take a look at the map below and park at the very west end of the parking area. The Lake Macbride trail is one of the best trails on the west end.